With the popularization and use of pulse Mist sprayer, more and more contact opportunities between peasant friends and it. 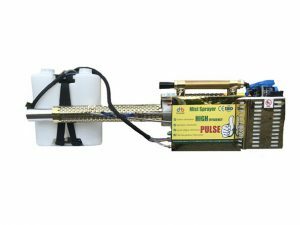 Because pulse Mist sprayer is a complex machine which combines circuit, oil circuit, gas circuit and so on, it is necessary to pay attention to some matters in the process of use to prevent unnecessary faults and injuries. 1. avoid strong collision, lightning and thunder. 2. only qualified maintenance personnel can install or repair the machine. 3. when using Mist sprayer, it will produce high temperature. Do not touch the high temperature part so as not to scald. 4. strictly prohibit the use of fogging machines in inflammable and explosive places. 5. when refueling, it must be carried out after the machine is cooled. No smoking or open fire operation is strictly prohibited. 6. In order to avoid absorbing ultrafine particles and high-concentration pesticides when spraying, the staff must wear a mask before operating the machine. 7.Mist sprayer should not be contaminated with gasoline, adding more than 90 clean gasoline. 8. the oil tank and the medicine box are pressure vessels. If the lid is not strict, the machine will not work properly. 9. Before Mist sprayer extinguishes, it is necessary to turn off the charge box switch and then the throttle. If it suddenly goes out, it is necessary to quickly turn the nozzle down and turn off the spray switch at the same time. 10. Tracheal Mist Sprayer should be lubricated regularly. If the machine uses dry batteries, please remove the batteries in time after using the machine, so as not to corrode the battery box for too long. The previous article：What is the difference between the wind driven mist sprayer and the pulse mist sprayer?